The AquaSolar® system from GoldLine Controls gives you total solar system control with digital display of pool temperature and solar system temperature. Plus, full system diagnostic LED’s. 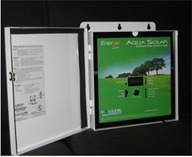 The Aqua Solar is set by a single dial adjustment for desired pool temperature. The AquaSolar® offers selectable high limit, programmable re circulation freeze protection and nocturnal cooling to customize any installation.